A mash of leftover musicians from bands as Botch, Kill Sadie, and Sharks Keep Moving, based in Seattle, Washington. The band is skilled at math rock among others. Their sound is described as 'Pele-esque guitar-taps and electronics with sophisticated time signature compositions'. The name Minus the Bear is the result of a comment one of the fans of the band made when asked about the proceedings of his amorous explorations of the night before. We did the math and our conclusion is that the fan's date had a happy end. 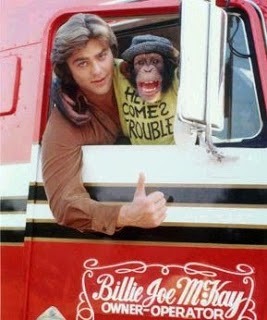 In the TV show by the way, on the screens for 48 episodes, main characters trucker B.J. (in full Billy Joe McKay) and his inseparable sidekick The Bear (it's definitely a chimpanzee, not a bear) had hilarious adventures in which everything went wrong, but in the end of course everything turned out all right.